Aching, sore muscles are no joke for runners, so after a hard run, you may be looking for ways to decrease muscle soreness and fatigue. One of the common myths that's still around today promotes lifting your legs after running to remove lactic acid. However, lactic acid does not cause muscle soreness, and lifting your legs after a run has not been proven to have any effect. Misconceptions regarding lactic acid began in 1929 when a British physiologist by the name of Archibald Hill studied frog muscles after exercising and found that they contained high amounts of lactic acid. This finding led him to publish statements saying that lactic acid buildup in muscle tissue was responsible for muscle soreness. Trainers and coaches looked for ways to decrease lactic acid buildup in runners and proposed elevating the legs. While the lactic acid myth has been disproven, some coaches and trainers may still promote elevating your legs after a run to speed up recovery. When your body breaks down glucose for fuel, the end result is a substance called pyruvate. If you are performing aerobic exercise, pyruvate is shuttled into a metabolic pathway to be broken down for further energy production. However, when oxygen is limited, your body will break down pyruvate into lactic acid, another source of energy. Lactic acid builds up in working muscle, especially during strenuous exercises such as running. However, when you stop running, oxygen becomes available again and your body turns lactic acid back into pyruvate. Lifting your legs has not been shown to have any effect on the rate at which lactic acid leaves muscle tissue. Muscle soreness and fatigue, while not being caused by lactic acid, relates to muscle cell damage that occurs during strenuous exercise. Exercise may strain or damage muscle which causes soreness, especially the day after you exercise. You may especially notice increased muscle soreness and fatigue after pushing yourself to run greater lengths or run at a greater speed. Soreness from muscle cell damage may take a few days to heal. Active recovery, used by many professional athletes, helps to decrease muscle soreness after exercise. This type of recovery involves lightly using muscle groups to stimulate circulation and speed up the delivery of oxygen and nutrients to fatigued muscle. 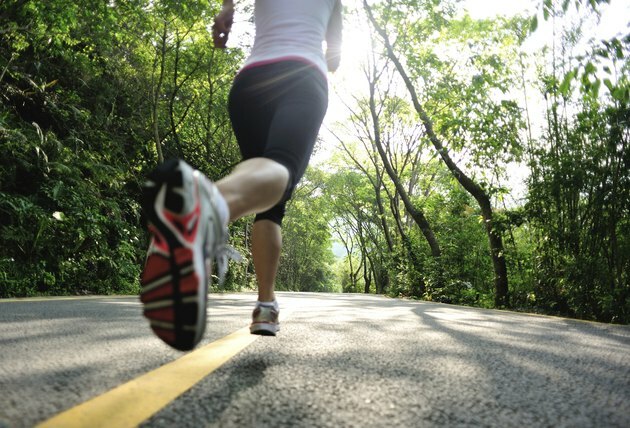 Walking after a hard run keeps your blood flowing and improves recovery without putting further strain on your muscles. The day after a hard run, you can continue to improve your recovery by swimming, biking or going for a light jog. Exercise Physiology: Nutrition, Energy, and Human Performance: William D. McArdle, Ph.D. Does Running on a Low-Carb Diet Burn Fat Quicker?